This is the third book in a two-part series. The series is split into seasons. I would say that the books could be read as stand-alones. Although, reading them all helps you to get all the background information. What person in their right mind forgets everything when a guy, and an overbearing guy at that, simply looks at you? I’ve read several of Lindsay’s books along with the other two books in this series. This is one of my favorites! It is definitely my favorite in this series so far. I fell in love with Hector along with Zoey. I’m not one to use terms like “book boyfriend”, but I did in a message to Lindsay after finishing this book. 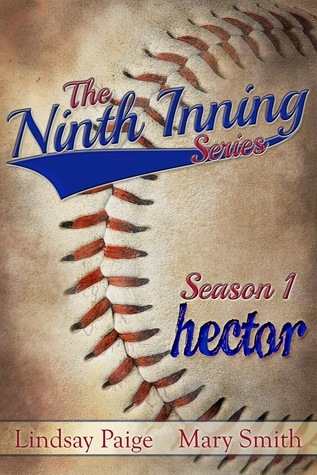 As the book progressed, I found myself hanging on Hector’s every word. He was such a sweet, kind and caring man. but the painting isn’t even worthy of wall in an outhouse." However, her aunts and Hector are much more open to her greatness as an artist. We are able to catchup slightly with Felix and Blake throughout the book. But we are also introduced to other players on the Memphis Angels baseball team. Hector fell in love with Zoey even before he knew her name. Zoey was more reluctant and made him wait before revealing her name and even then it was inadvertently.Both Hector and Zoey are stubborn in their own ways. The saying opposites attract fits Hector and Zoey to a T. They are from different worlds. Zoey is scared by their differences. But Hector knows she’s the one for him. Unfortunately, Hector’s mother refuses to accept that Zoey is the girl for him. This causes tension between Hector and his mother as well as between Hector and Zoey. Then there’s the Ending. Yes, I am making that a capital E Ending. Aww, Lindsay and Mary have killed me with this ending. It’s not really a cliffhanger. It just ended in a way I wasn’t expecting. I was all wrapped up in the pretty package of Hector & Zoey's new romance and wondering what would happen with them next. Then a new ball is thrown into the mix and knocked me for a loop. I can only hope they chose to end it this way because they have thoughts of continuing Hector and Zoey’s story. Hector is definitely swoonworthy! He's one of those guys that everything he says or does shows the love he has for Zoey and his friends and family. Just an overall good guy. I can't wait to hear what you think of this book.